I was reading Arcweb SAP Insider 2010 related to the manufacturing, sustainability and product lifecycle management domains. The tag line “End-to-End Business Process Management” came to my attention, so I decided to go inside and try to understand what SAP is up to in their new PLM deliveries. The overall document is heavy loaded with general statements about SAP and their investment into PLM program, important customer needs and problems that can be solved by SAP PLM. In the area of new product development, I found three pieces of new release achievements: 1- SAP new user interface; 2- New Project and Portfolio Management; 3- Integrated Development Environment. The last one was related to the information about end-to-end business processes I was looking for. SAP PLM’s offerings for the Integrated Development environment. Following the theme of end-to-end business processes, SAP PLM has focused on the need for a comprehensive product development and innovation approach. This would involve multiple components of their PLM solution portfolio including robust CAD integration, project and portfolio management, single repository for product and process data, and a collaborative development platform that manages role-based IP protection. One of the more interesting offerings in this area is an Integrated Product Development platform for discrete industries and a companion IPD for the process industries. IPD for the process industries included specific solutions for area like recipe management, material and task sourcing, compliance, and document management. This follows the trend among PLM providers today to focus on specific industries with tailored solutions sets. 1. How to capture existing business processes? 2. What is the process of “solution tailoring”? 3. How IPD will be integrated with non-SAP modules and tools? End-to-end business process management is a nice marketing slogan. In the end, there is nothing more than pieces of product and process data that need to stick together. SAP Wizards assumes that they know how to put them together to get an organizational job done by providing a specific tailored solution. Maybe they are right. However, the process to do so will contain lots of small steps related to existing business processes analyzes, integration and customization. I turned me back to one of my previous posts: PLM Best Practices Torpedo. End-To-End Business Processes are set of best practices on top of the single product and process data repository. What is my conclusion after all? End-to-End processes sound very profound and attractive. However, it seems to me SAP was focused last three years on how to gather all definitions and implementation practices to introduce the comprehensive product portfolio making best practices for customers. The implementation of such can be bumpy and requires lots of energy, skills and the most important – time. The last becomes the most critical for manufacturers today. I’d like to quote another pace from the same write-up: “… that the number one goal for manufacturing companies was to reduce “time-to-profit” for new or changed products...”. 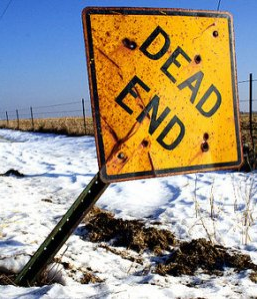 With long PLM End-To-End business processes implementation cycles this goal will not be achievable and can easily become Dead-End. Are you really being fair? It is hard to believe that DS can point at a competitor and say they are over complicated. If SAP is complicated then what do you say about DS? I agree that process automation is both complicated and a holy grail and that the reality is you can define high-level check point but not details of what people do. So if you boil down what you are saying what do you get? Are you saying the high-level overly complicated process oriented system are out of date before they are deployed and that it is better to take a bottom up simple approach? Or is there another take away?